In this post, I mentioned that my new-to-me Spectrum could use some lower gearing. Despite getting quite a good arm workout trying to climb at 25 rpm on the local steeps, I have concluded that I would be well served to get moving on that goal. With a low gear of 42-24, doing certain ridge climbs around here is pretty impractical. At least for me… now. I could have lived with that gearing when I weighed 140lbs, but I am 165 these days and in poorer shape, so it’s a no-go. BB with a longer spindle, too, of course. I would be running a 53-42-30, or 32. (I have both a 30 and 32 in the parts bin). When looking at the two options from a gear inch point of view, I determined that the 50T is going to be annoyingly high still, and the 34T is going to be too small for anything other than climbing or very casual riding. Really, the 42T is a good size for a lot of riding. 46T is even better, actually. I was half tempted to go with a 46-30T double, but the 46-13 is not much of a high gear. I am certain I would have cursed it. 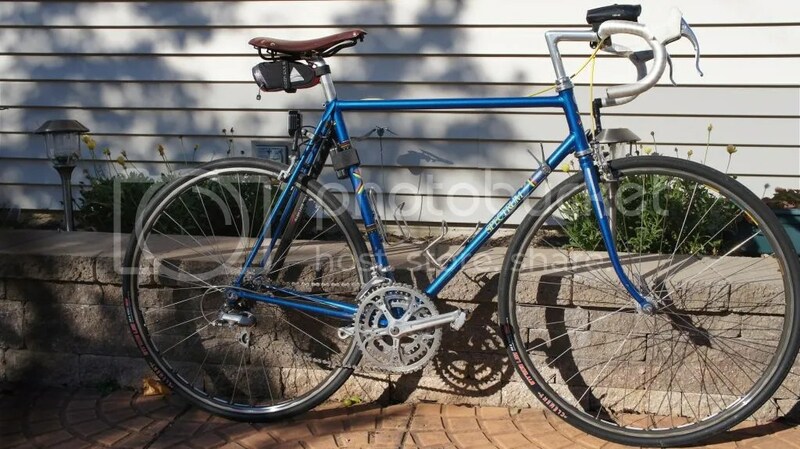 Perhaps a 46-12 or 46-11 would be ok, but with only room for 7 speeds in the back, and a desire to go no smaller than 24T as my large cog, I would have to live with big jumps. Ho hum. I decided that The 53-42-32/30 would provide me the best overall gearing. 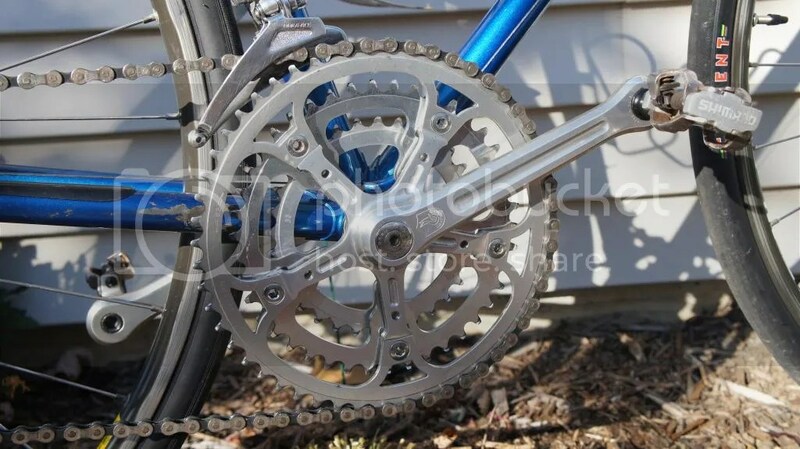 And really, parts-binning a classic Campag crank in favor of a more modern crank (even if it’s retro styled) is some kind of terrible cycling sin. Velocio is rolling in his grave for me just thinking about it. since literally the early 80’s, but they musta used enough grease at the time as nothing was frozen. Fixed cup was a little tight, but I got it done. need to put on the set of Simplex retrofriction levers I have in the parts box. I have already tried the obvious fixes- tightening the fixing bolt on the shift lever and making sure the cable doesn’t have too much friction at the BB cable guide. They helped but didn’t totally solve the problem either. The 32-24 low gear is still a little high, but I think at some point, when I get a 13-28T freewheel or freehub, I’ll be good for most routes around here. (I am still overgeared a bit but it’s manageable now). I am in love with a Granny.